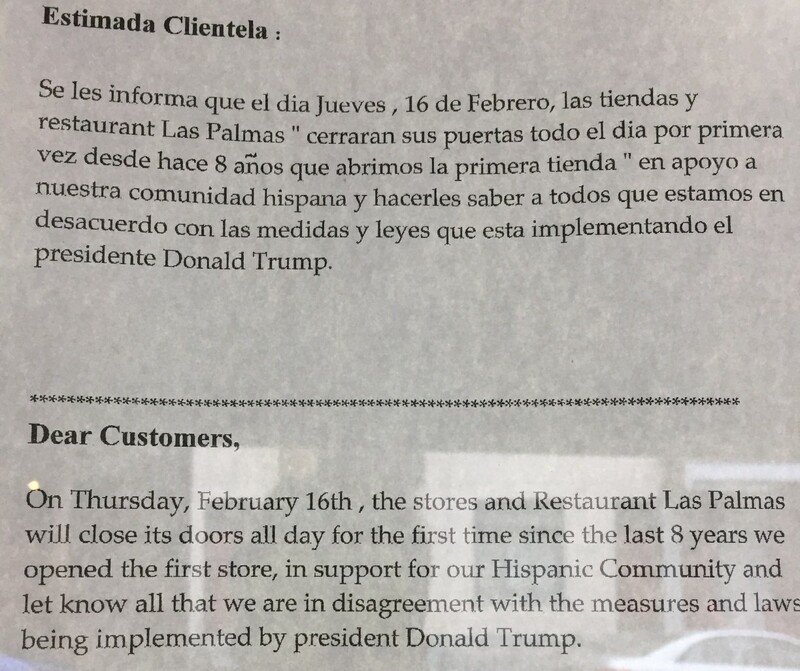 Las Palmas Restaurante will close up shop today, along with Mexican restaurants across the country as part of the “Day Without Immigrants” national protest against President Donald Trump’s immigration policies. A manager of the Oakland location, Andres Ramirez, 20, said the store plans to act in accordance with the other Las Palmas locations. The “Day Without Immigrants,” or “Un Dia Sin Immigrante,” is a nationwide protest where Latinx and Hispanic-American immigrants are not showing up to work. Manager of Bea Taco Town Erick Martinez, 25, of Greentree, said the protest is about more than just not showing up to work, but about “not contributing to the economy.” Martinez, who is from Mexico, will also be closing his restaurant today. Martinez said he faced a difficult time deciding whether or not to close. He said many immigrant workers can’t afford to give up a day of work. In the end, he sat down to speak with his staff and decided the protest was worth it. Martinez said he heard about the event through other immigrants in Pittsburgh. The idea for the daylong protest spread mostly by word of mouth and through social media outlets such as Twitter and Facebook. Facebook groups such as Reforma Migratoria — a social justice group with over 99,000 followers, meaning “Immigration Reform” in English — are encouraging immigrants to participate in the protest. On Twitter Wednesday night, the hashtag “#DayWithoutImmigrants” appeared in more than 15,000 tweets. While much of the trending social media posts about the event focus on Hispanic and Latinx immigrants, Martinez said immigrants of all backgrounds should participate in the protest.